Winter Wonderland Staten Island is an 85,000 square foot immersive holiday experience for children and adults of all ages. 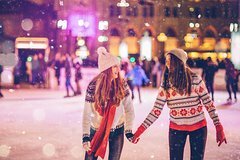 This seasonal event features an ice-skating rink, holiday market, rides, games, nightly light shows, Santa’s workshop, a life sized Gingerbread House and much more! The event takes place at Richmond County Bank Ballpark at St. George, located just steps from the iconic Staten Island Ferry terminal. This seasonal attraction includes a light show, with choreographed holiday lights show featuring over 100,000 lights that dance to an ever changing list of classic holiday songs. Come over to Santa's Workshop and get a glimpse of Santa in his natural environment, the North Pole, and even take a picture with him, then stop by the Build-A-Buddy area to craft a stuffed holiday friend. Visit the North Pole Shoppe for a large selection of seasonal gifts and novelties and stop by the Igloo Bar serving bar food and seasonal cocktails alongside dueling pianos, cabaret, and nightly live bands, DJ’s, and talent from across the country. At Gingy's Bakeshop you'll take a life sized walk through a gingerbread house with a working bake shop, candy store and cookie decorating area. Enjoy holiday themed carnival games, Mount Liberty - our alpine snow tube slide, a reindeer run, snowball pit, and even the Blizzard Box - snow experience, plus a 9-hole mini golf course. This holiday delight will be a treat for all ages!